Overnight backpacking trips are phase two of our money-saving strategy for Australian travel (phase one: live in a tent) — just another way to sequester ourselves even further from the expensive edible temptations of the developed world. 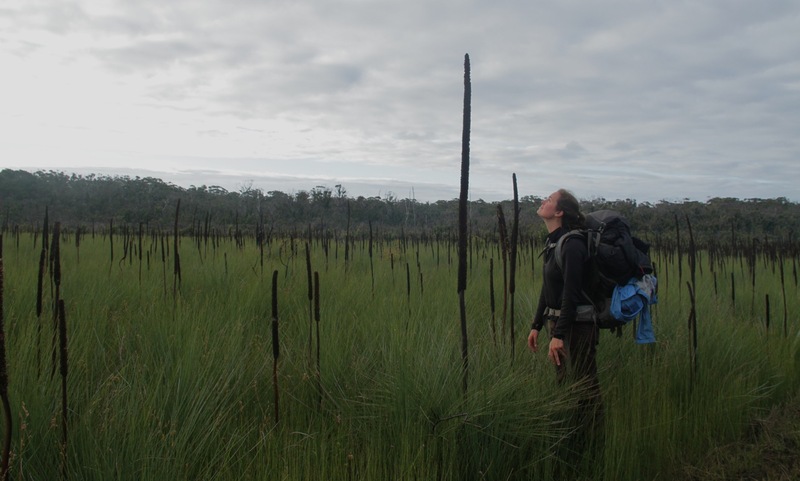 Fortunately, exploring the wilderness on foot is an excellent way to see the country we are here to see, and our first four-day walk through Croajingolong National Park was a wild success. 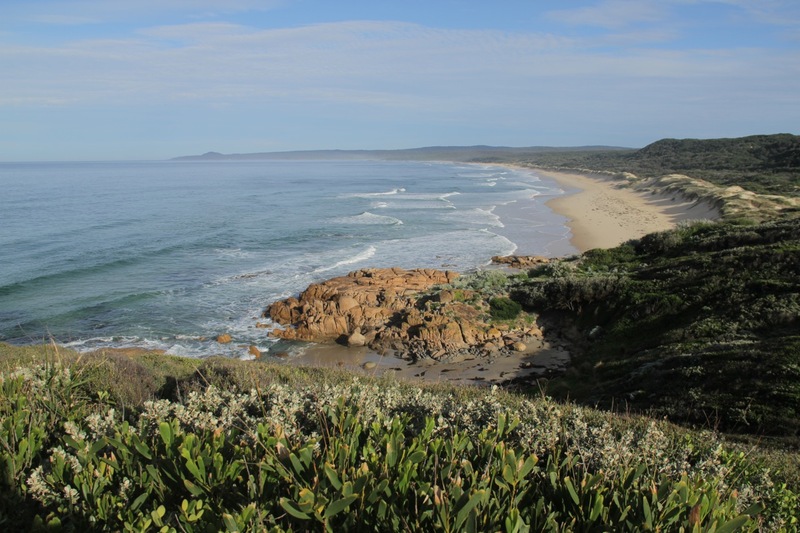 The Wilderness Coast Walk extends along 100 kilometers of Victoria’s deserted northeastern coastline, and it sounded sufficiently remote and beautiful to warrant a few days of our time. 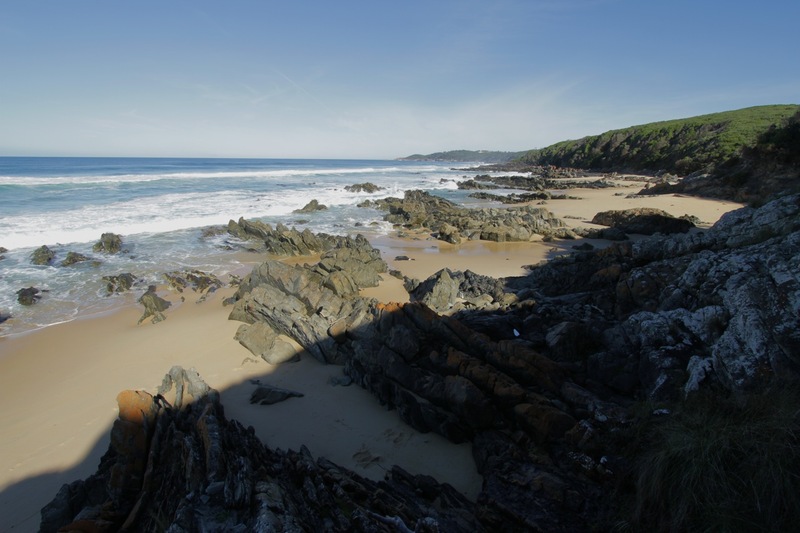 We woke up in the wonderful Mallacoota Foreshore Holiday Park on Tuesday morning, shuffled food and gear around for a few hours, and finally left the Shipwreck Creek trailhead at the unimpressive hour of noon. The first day of walking took us through gorgeous fields of pale green and wheat-colored grasses, swaying in a slight breeze and dotted with bright pink winter flowers. Over the edge of the cliffs, the ocean spread bright blue in the background, and filled our ears with a distant roar. The trail changed character every few kilometers, and once again, we walked through miles of strange, foreign vegetation. 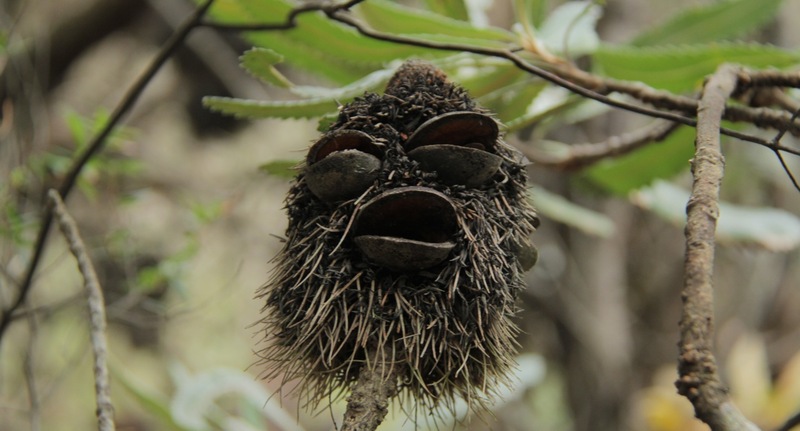 Huge, spiky cattail-like spires grew from clumps of wiry grass, and little objects that looked remarkably like Furbies hung from the branches of trees. They looked like they might hop off at any moment and start scurrying around. 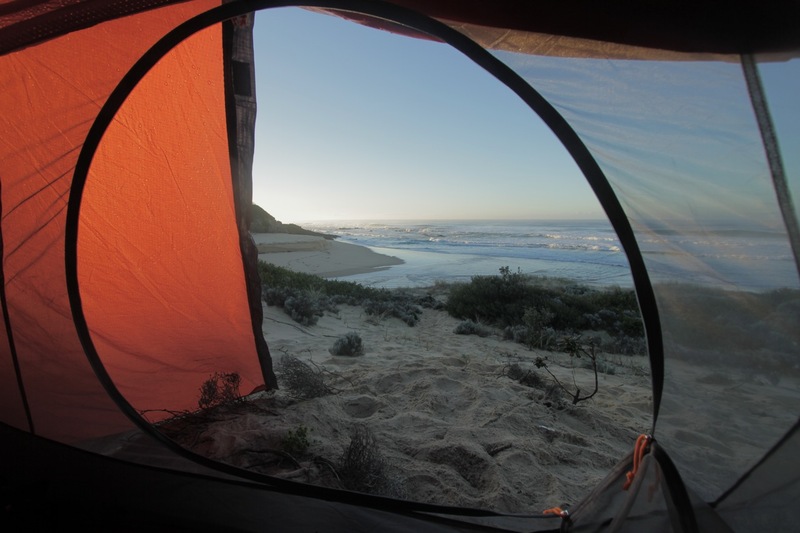 As evening fell, we crossed the mouth of the Benedore River and set up our camp on a dune high above the isolated cove. Unintentional but fortunate timing meant that our first night coincided with the full moon, and we waited patiently and eagerly for the clouds to break aside a crackling campfire. 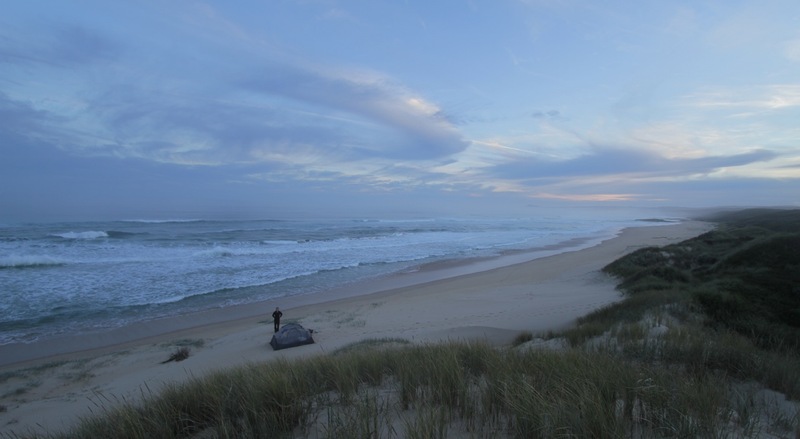 Before long the landscape was bathed in bright silver, illuminating the dunes and sparkling off the ocean…magic. At 7 a.m. we awoke to warm morning light streaming in from behind a rocky point. 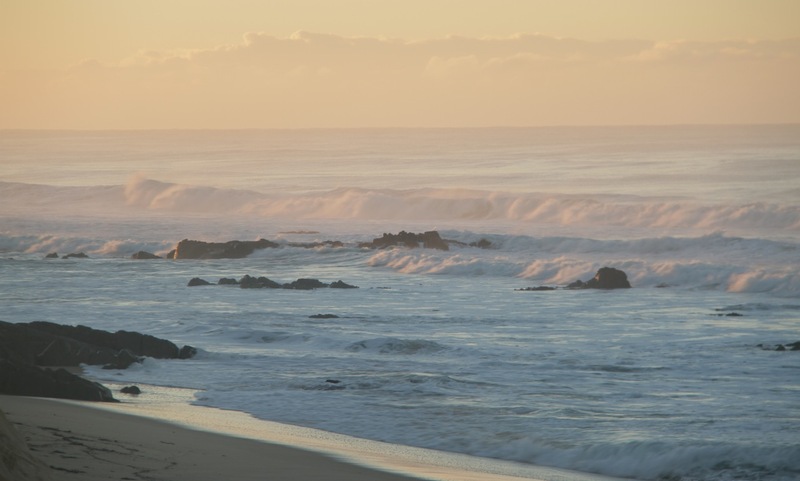 Cresting waves from a large southern swell thundered ashore, the arcing sea spray and glassy water cast in brilliant color contrasts of peach and deep blue. We lingered in our sleeping bags until the temperature rose, agreeing that it was the most amazing place either of us had ever pitched a tent, and one of our favorite moments of the entire trip. The actual walking, however, did much to lower our spirits, as the state of the trail between Benedore and Red Rivers was horrendous. 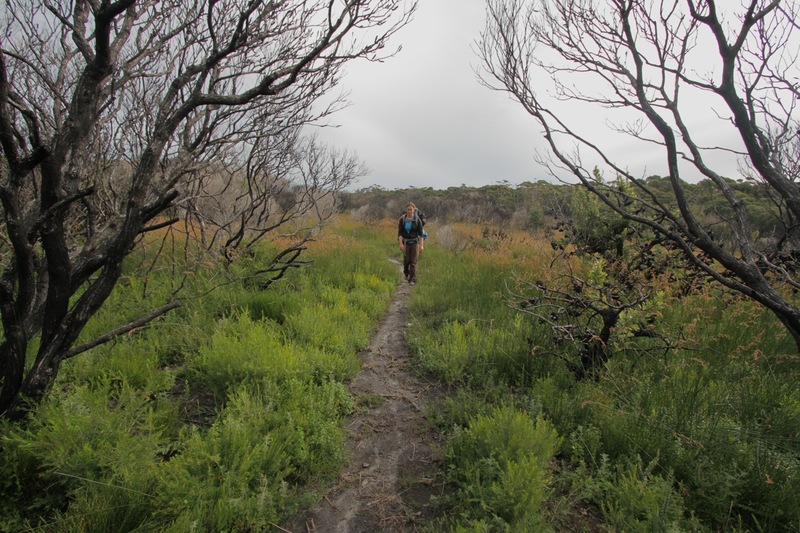 It wound so far from the ocean that it could hardly be called a coast walk, and led us through some extremely desolate and uninspiring landscapes. 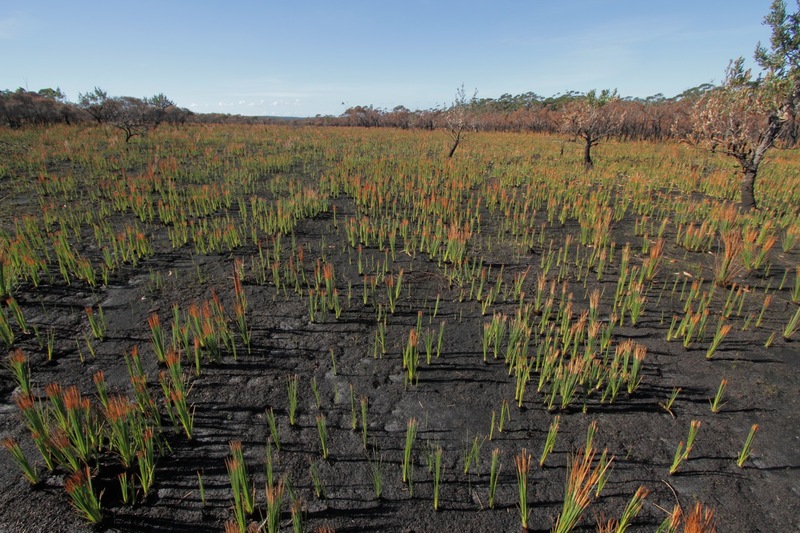 Much of the forest had been affected by a wildfire (as most of Australia seems to be) and the ground remained soggy from recent rains. Eventually, the trail became difficult to find, and we had to bushwack through years of overgrowth. Pretty soon there won’t be a trail there at all. But lots of righteous complaining about the lax trail maintenance and how much better the trail would be if we were in charge kept us entertained. The colors in this charred section actually made it one of the brighter spots in the walk. 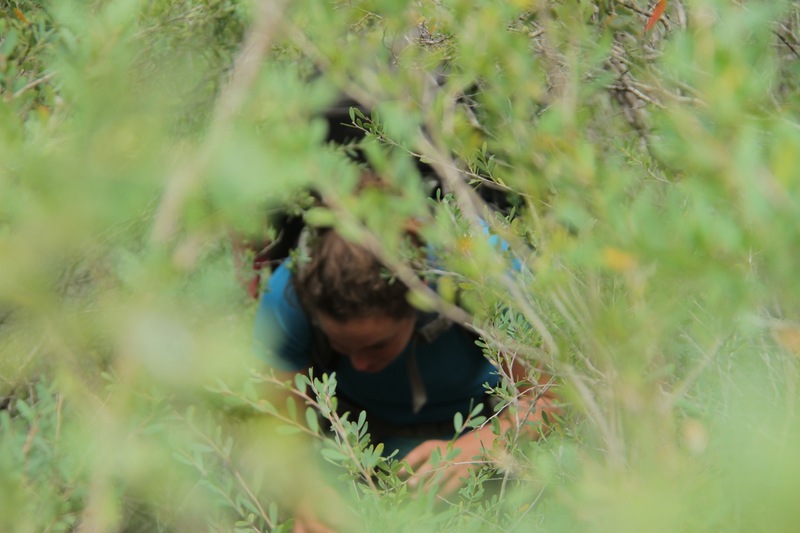 Pushing our way through such thick shrubberies, our packs knocking assorted debris onto our heads and shoulders, led to other misfortunes: ticks. Disgusting little fellows. Glad to have been blessed with opposable thumbs, we pried two from Steph, who has developed a disturbing tendency to be a magnet for blood-sucking parasites. The trail soon ended, and in doing so made up for its shortcomings. We broke out onto yet another incredibly long and beautiful beach and pitched our tent above the high tide line. 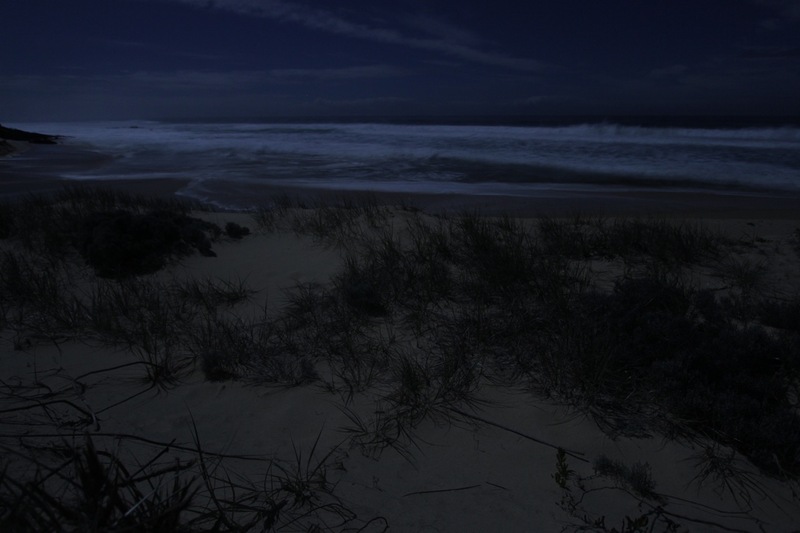 Another bright moon, another night falling asleep to the sound of the waves, and another morning waking up to the sun drying the sea spray from our tent. Looking back along the beach. Our tent is somewhere in the distance. The last half of the trip was spent retracing our steps— certainly not ideal for an overnight backpacking trip, but we had no car shuttle and no loop trail to lead us back. We were not sad to revisit our first campsite, and really, it was the places the trail led to, not the walking itself, that was the highlight of the trip. Large crashing waves, the smell of the sea air, crabs scuttling in tide pools— there is just something about a cold ocean coastline that appeals, even after the postcard-perfect beaches of the tropics. Though we loved our time away, we were ready to return to the comforts of car camping by the end. We celebrated our successful expedition with a box of cheap wine and some enormous, magnificently delicious cheeseburgers. This entry was posted on May 23, 2011 by Five Eyes Films. It was filed under Uncategorized and was tagged with australia, hiking, oceans. Sounds like a mixed adventure this step of the way!!! The beaches look beautiful and I could hear Steph’s voice from here as you bush wacked through!! 🙂 Love you both!! What a beautiful place to explore! 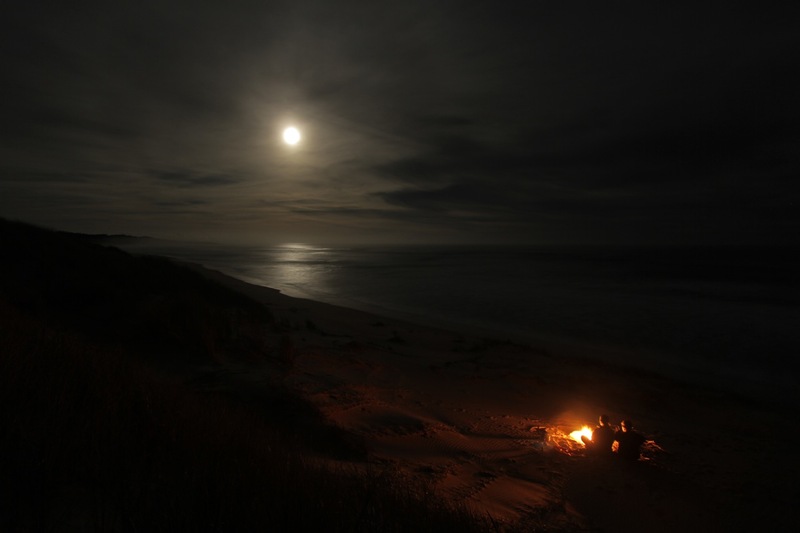 Camping along the coast among the Full Moon sounds so peaceful and relaxing. I’m glad the little ‘furby’ creatures didn’t come alive!! yeah, me too! sounds like plot for a really bad movie. Leeches, Ticks, and bears OOOH MY! The inspirational sights and views make you wonder why it’s so desolate of people until you factor in the other things – what wimps we’ve all become. Thanks for the visit! Really cool guys! Those things really do look like furbies! 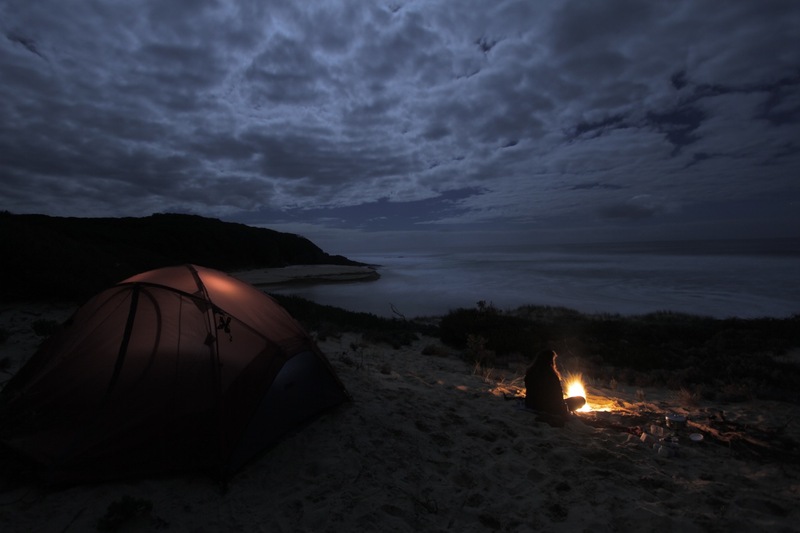 Your campsites look very beautiful – love the shot of the two of you at the fire! I wish I could listen in on your commentary while bushwhacking – you 2 are so funny! Love you both! Even though I have no idea what a ferbie is that is a good name for it. It looks hungry. Your photos and writing are absolutely beautiful! Thank you for sharing your travels. It is so inspiring. Love the photos taken at night. Magic! thank you. full moon camping is something special. Hi, just came across your movies and blog. Awesome stuff. I grew up in that part of Victoria you were hiking in. I think we did some of that walk on a school camp. You never appreciate it when it’s in your backyard. And beautiful footage from Japan. Having returned in march from our 2nd trip to Hokkaido, I’m in love with it. Thanks for sharing your memories. I hope everything will get addressed. I watched a great guide on this other internet site.